My mother said not to, but it turns out that it’s okay. 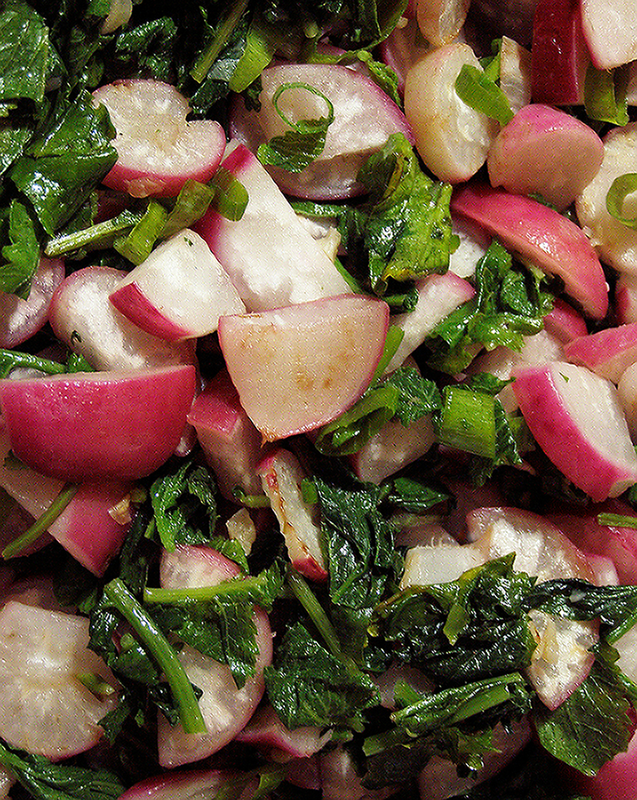 Eating radish greens, that is. At this time of year, they’re young and delicious, and can be eaten simply steamed or even raw, if you dare. This recipe combines the best of both worlds by sautéing both radishes and their greens together with a little garlic. It makes a brightly colored and novel side dish, and the sharpness of the radishes as well as the fuzziness of the greens disappears in the cooking. Debbie from Live Earth Farm adapted this recipe from an old Gourrnet magazine recipe, and I have altered it further by using olive oil in place of the butter, and adding the sprinkle of salt and black pepper at the end. I’ve also doubled the garlic on occasion. Cut greens from radishes, wash thoroughly and coarsely chop. 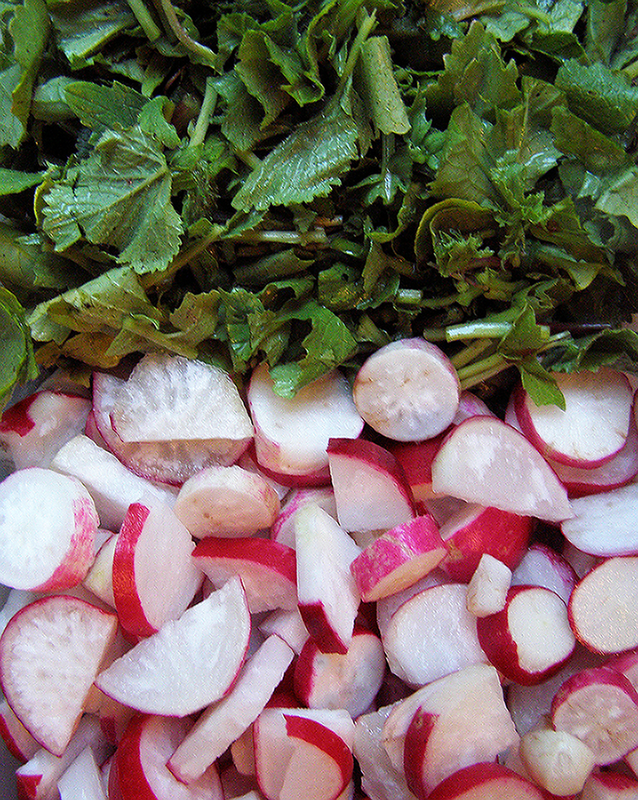 Trim radishes and cut lengthwise into wedges or into crosswise slices. Try for equal size pieces. Heat some butter or oil in a heavy skillet (or use an electric frying pan like I do) over moderately high heat until foam subsides, then sauté radish wedges with a sprinkle of salt, stirring, until crisp-tender, about 5 minutes. Transfer to a platter and keep warm, loosely covered. Sauté garlic in some more butter or oil in same skillet over moderately high heat, stirring, until fragrant, about 30 seconds. Add greens and sauté, stirring, until wilted and water has evaporated, about 1 minute. Return radishes to skillet and stir in chives. Serve immediately, topped with grindings of fresh sea salt and black pepper.